Today’s “Card of the Day” features a flute and a reveal of an SP kitten that barks (???). 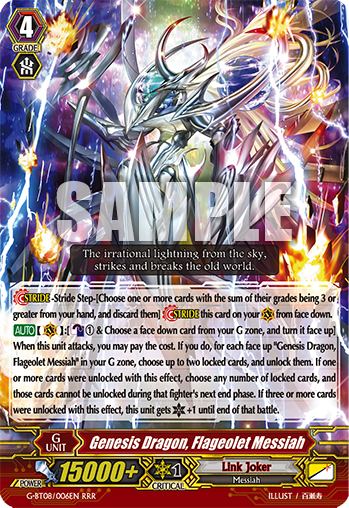 [AUTO](VC):[Counter-Blast 1 & Choose a face down card from your G zone, and turn it face up] When this unit attacks, you may pay the cost. If you do, for each face up “Genesis Dragon, Flageolet Messiah” in your G zone, choose up to two locked cards, and unlock them. If one or more cards were unlocked with this effect, choose any number of locked cards, and those cards cannot be unlocked during that fighter’s next end phase. If three or more cards were unlocked with this effect, this unit gets [Critical] +1 until end of that battle. [AUTO]:[Put this unit into your soul] When this unit is put into your bind zone from (RC), if you have a vanguard with “Chronofang” in its card name, you may pay the cost. If you do, draw a card, choose one of your vanguards, and it gets [Power] +5000 until end turn.